For most Hanoians, cốm (green sticky rice) is one of the capital’s most important symbols of gastronomy and elegance, and so is bánh cốm (sweet cake made of green sticky rice and green beans). Living in the capital without savouring bánh cốm would be a major shortcoming of your Hà Nội experience. I’ll tell you why. Bánh cốm’s symbolic reputation comes from where and when it originated and was first created in 1865 by the ancestors of the Nguyễn Duy family. 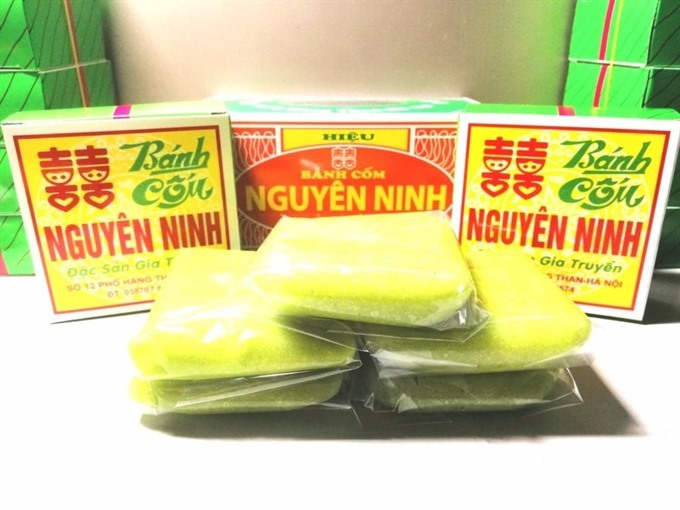 With the brand name Nguyên Ninh, these first green sticky rice cakes were also created to honour its motherland – Yên Ninh Village which used to be famous for the finest green rice cakes. Green sticky rice, the cake’s key ingredient, used to be imported from Vòng Village, the homeland of harvesting green sticky rice in the heart of every Hanoian. Nowadays, to meet the requirement of modern producing system and to satisfy the increasing amount of the customers, the Nguyên Ninh store imports green rice from other localities like Thái Bình Province. Vòng Village today belongs to Dịch Vọng Ward, Cầu Giấy District, Hà Nội. Green sticky rice from the village has a signature colour, flexibility and flavour which no other locality can compete with. “Why among the vastness of beautiful Việt Nam, where paddy fields stretch to the end of the horizon, the best green sticky rice can only come from Vòng Village?”, famous author Vũ Bằng, a Vietnamese gastronome, once wrote in his influential book The delicious dishes of Hà Nội. 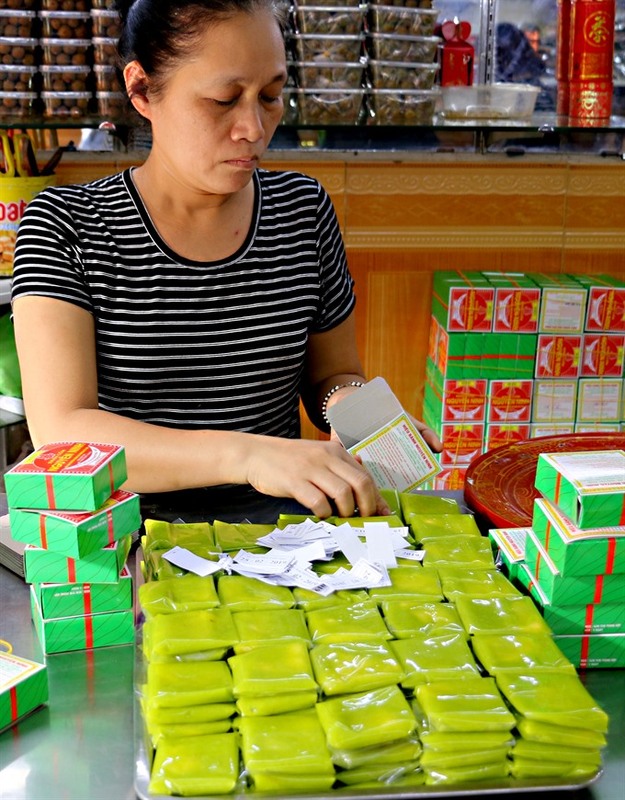 Although the place isn’t the ingredient distributor for Nguyên Ninh anymore, the village still makes and sells green rice thanks to its reputation. Green delights: A customer buys bánh cốm at Nguyên Ninh Store at 11 Hàng Than Street in Hà Nội. The making of bánh cốm can be expressed in two words: meticulous and elegant - just like the place it originated in. From ingredient selection to packing, everything has to be perfect to create the finest cake and to preserve 153 years of reputation. Let’s start with the green rice. Different from young green sticky rice, bánh cốm is formed by an old kind of rice imported from Thái Bình. This means the rice is cut right as soon as the seeds are ripe green, because the younger rice when fried with sugar will melt completely and can’t be used to make a crust. Maybe that’s the reason why we can enjoy bánh cốm cake year around while the best cốm only arrives during the early harvesting seasons from April to May. “Our great grandmother Trưởng Ái came up with a historic idea of making the first bánh cốm in Việt Nam in 1865, and the rest is history,” said Nguyễn Thị Hiệp, one of eight great grandchildren of Trưởng Ái who have inherited the family trade. After processing, the harvested green sticky rice is put into pots and covered tightly. Green beans for making the paste have to be carefully selected from a mountainous area in Sơn La Province to guarantee the best quality. By adding puree additives like lotus jam and grated coconut, the cốm is marinated in a special way and is then stir-fried on a hot pan with caster-sugar for about two hours until the seeds are condensed but still with the signature green colour. Before everything is set, a little bit of distilled grapefruit water can increase the flavor of a delicious bánh cốm. “In every stage of making the cake, stir-frying is the most important. Bánh cốm will become too soft or too over - cooked if something goes wrong with the fire power adjustment or the skill of the chef, so this stage is extremely decisive. After all the hard work, a perfect cốm cake with tasty green sticky rice layer on the outside, and fresh yellow green bean paste alongside white grated coconut from the inside which are perfectly blended with each other to create a flavourful masterpiece is ready to serve the most picky diners”, said Nguyễn Thị Hồng Vân, also another member of the Nguyễn Duy family. 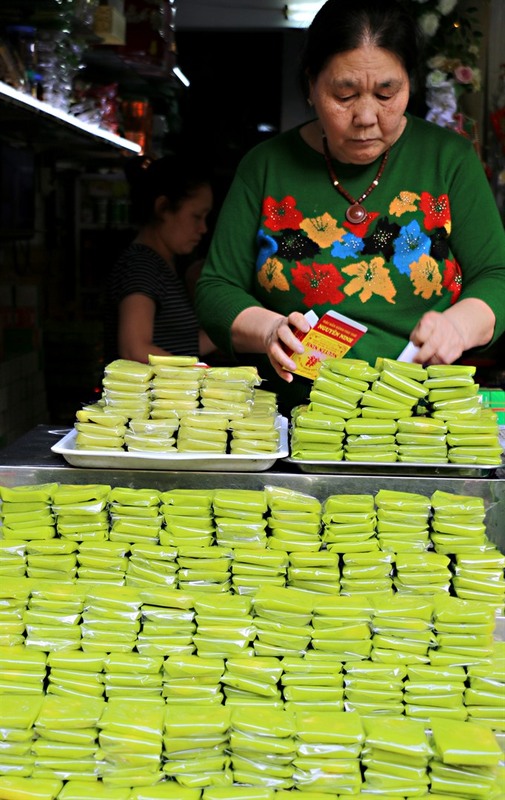 Quintessence of Ha Noi: A woman packs her bánh cốm. Perhaps this is why after 153 years, Nguyên Ninh’s bánh cốm is still the best as every single secret recipe and technique is only known by members of the Nguyễn Duy family. “Hà Nội’s cốm cake has its unique flavor that you would never be able to find anywhere. Every time I visit this capital, I often buy the cake at Nguyên Ninh store as a lovely gift for my family members and friends in HCM City”, said Hồ Nguyên Ngọc, a young Saigonese who love the square shaped cake. “Tasting bánh cốm is like savoring every single throwback memory of childhood. With the sweet and flexible green layer reminds you of peaceful paddy fields, of labour beauty in the hard old days,” 53 year old Nguyễn Văn Tám, a Hanoian his whole life, saidy about those good old days. Bánh cốm is a symbol of Hà Nội, not only because of its origins, but also due to its influence on the culture and lifestyle of Hanoians. None expressed this better than author Vũ Bằng, a writer whose literary works are as inspirational as his love for the capital. “After rewinding every piece of childhood memory, I realise that Tết holiday isn’t what I miss the most, also not for those happy days and definitely not for any of those old love stories that have passed by, but some randomly mornings before school, when my mother used to prepare a small set of Vòng Village green sticky rice for me as breakfast whenever autumn arrives. That was it, but somehow, don’t know why, it always takes tears from my eyes whenever thinking about it,” Vũ Bằng wrote, describing the childhood of many Hanoians.